The old Glass Bank in Cocoa Beach is currently being demolished. Besides being a local landmark, this early 1960s building at one point represented the future and the dawning of the Space Age. Sadly, the building could not survive the passage of time and changing tastes, an onslaught of destructive hurricanes, and a bad real estate market. Take your pick. 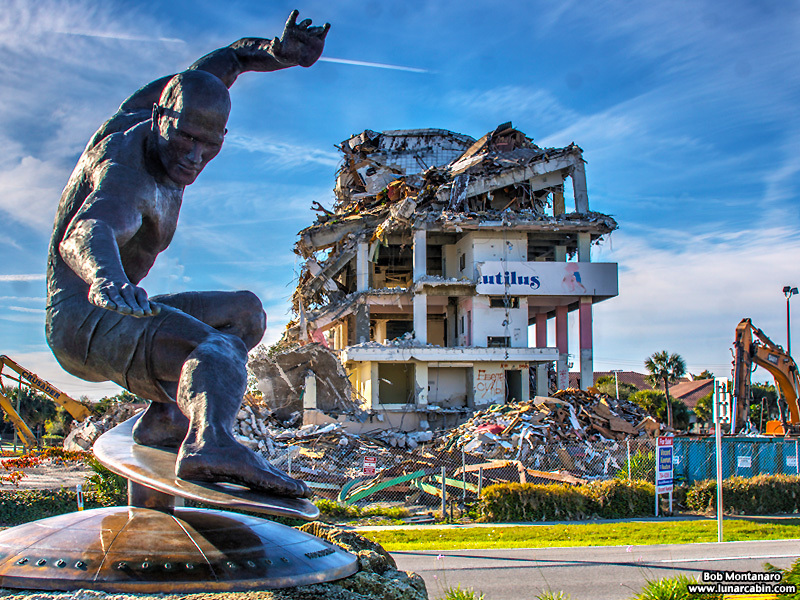 I have been documenting the destruction for a longer photo feature blog to come in the future but here is how the building looked last Sunday looking over State Road A1A past the bronze statue of local surf hero Kelly Slater that stands in a park across the street. The image makes me think of Ozymandias. More amazing than in ‘real’ life!